How appropriate that the week of Halloween we should find ourselves painting. 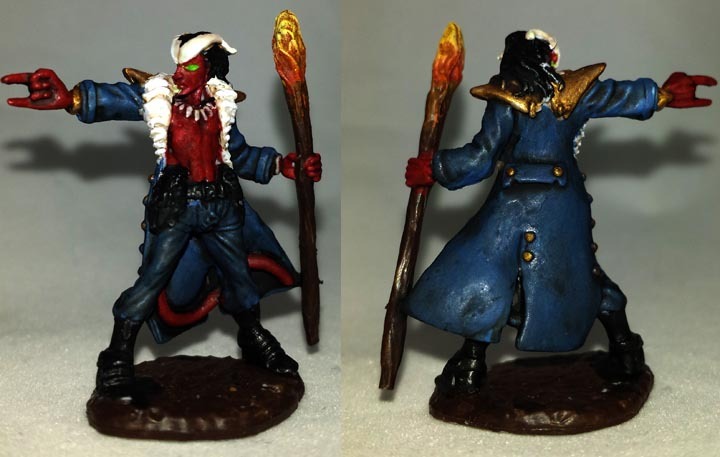 Painting a demon, well – hellborn wizard, whatever that is. Thank you for all the suggestions that were put in the comments last week. I’m running terribly short on time this weekend, and will add them to next week’s post. I thought red would have been a popular (if cliché) color scheme this week, but was only half right. I decided I wanted Damien to match the succubus we painted in the early part of the year. I am particularly happy with how the staff came out. When I couldn’t make the yellows pop, I went with a white highlight and a yellow glaze to knock it back down. Arjen split the difference between the color scheme Dirk and I used. I really like the palate, and think he had great results considering the limited time he spent painting this week as he was ill.
Grognard is just showing off here. I mean, look at the blending on that cloak, or subtle color highlights on the staff and necklace. Just out of curiosity Grognard, how much time did you spend on this mini? Dirk never misses the opportunity to do some freehand painting, check out the epaulets on this guy; he not only stole my jacket color scheme, he one upped it! I love the blotchy effect of the skin on this guy. Dirk has somehow managed to make pink and purple look sinister. 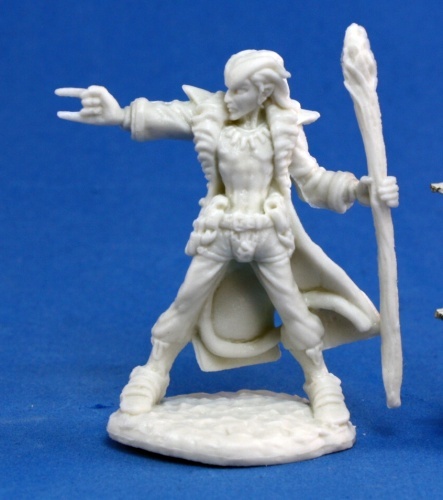 TBD – suggest a mini you want to see painted in the comments. Amazing job, all of you! Great work on this guy, everyone! I especially like the Grognard’s shading and color work on the jacket, and Arjen’s hair color work. You’re right, Dirk’s detail work is wonderful, and I really like David’s body color choice. Excellent stuff! I missed it yet again for various reasons, but I’ve finished up a few of the upcoming ones. Thanks… I was a bit worried that the shading on the jacket would be too subtle, but it worked out well. LOVE the freehand on dirk’s model… I REALLY wanted to do some on the cloak but I was too chicken as I didn’t want to ruin the blend. My regrets are, being too scared of freehand and being WAY too scared of OSL. I have a really well set up workspace. I should take pictures of it when my newly purchased reaper paints arrive. Right. David was on a roll: not only does his staff look super, his clothing has nice highlights as well. Grognards staff is really special as it has a look that could be both a jewel and some sort of flower, making it kind of a magical illusion. 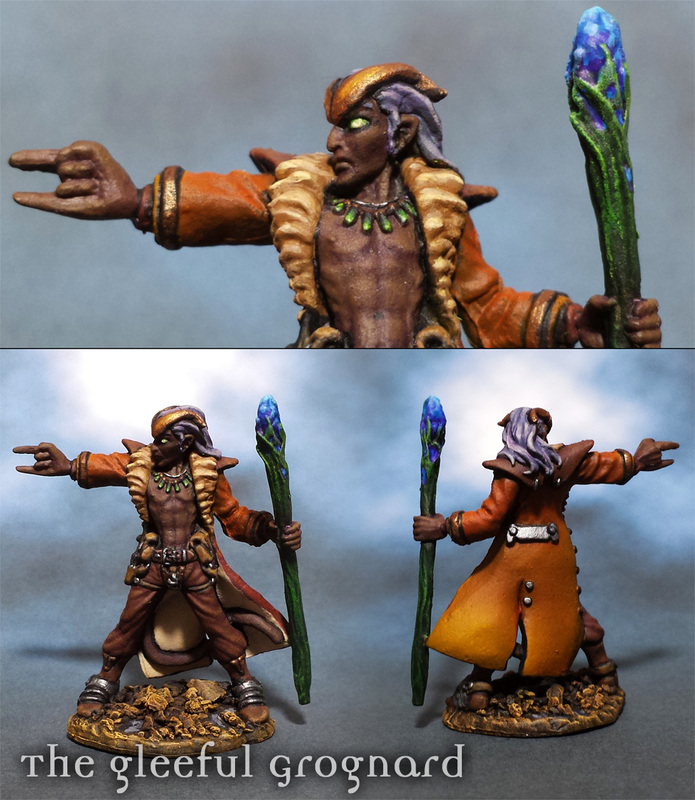 What I really love about his work is that those details like the abdominal muscles where us lesser beings just slap some paint on and hope the slight height differences do their work…he actually paints them. Dirk’s devil makes all ours look like choirboys. 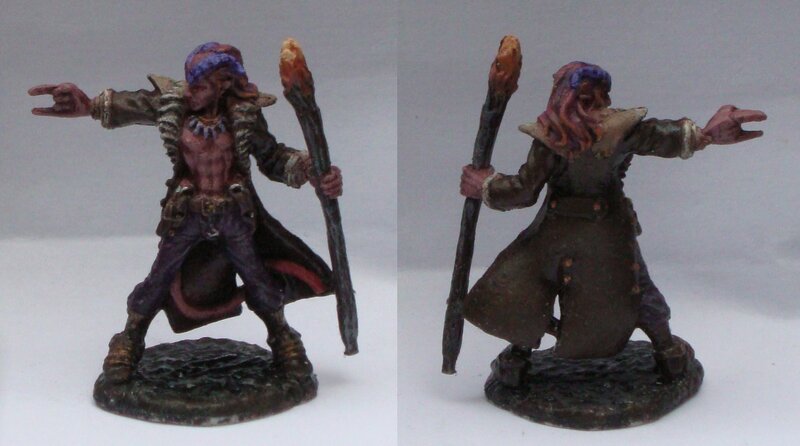 the purple skin and that staff…is it dripping brains? Awesome work, all! 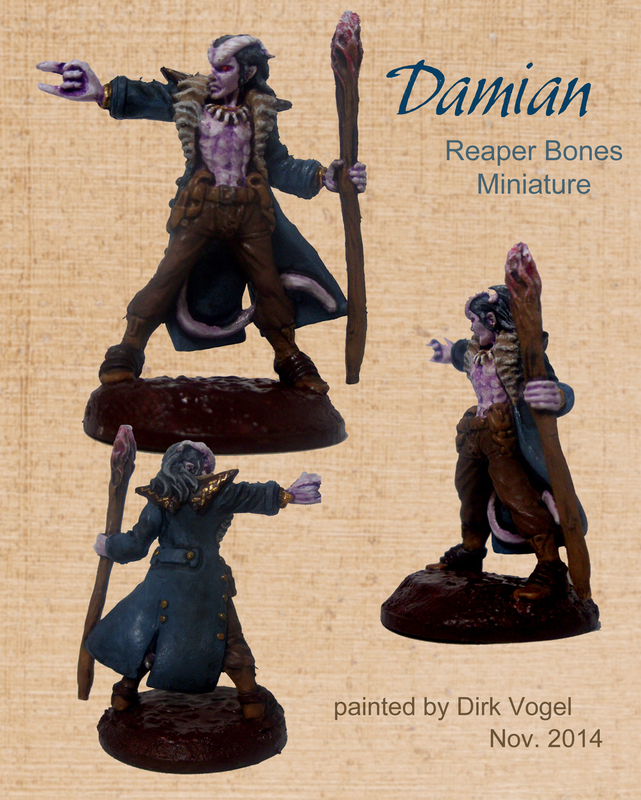 I didn’t have time to get any painting done last week, so Damien is still on my “to do” list. Clearly the bar has been set rather high! Nice work everyone! I’ve been super busy lately so have missed a bunch of these, but I really like this mini, so I might try to catch him up someday!